Author: Marty Cagan. Product legend. Founder, Silicon Valley Product Group. 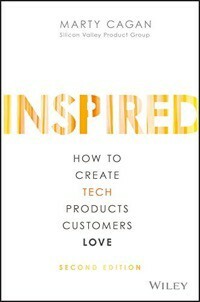 Why you should read this book: Inspired is business school for PMs. In tech, Marty sees the success of the product as the success of the company. The stereotypical business school concepts of branding, accounting, marketing and so on are ONLY relevant after a product has attained market fit. Marty obsesses on making an awesome product and that passion comes through in his writing. What’s unique about this book: Marty goes deep into Product Discovery. He details the character traits and work behaviors of great Product Managers. He addresses how to structure, recruit, and manage a Product organization. Jim’s Advice: Read the last 25 pages first. Pages 311 to 326. These four chapters (he calls it “The Right Culture”) connect with good Product Managers who dream of being great. Another tidbit, Marty wrote the first version of Inspired (2008) three years before Lean Startup (2011) made many of his concepts famous. Audience: For existing PMs who want to become great at their jobFor CEOs and Heads of Product who want to know what a high performing Product team looks like. Style: Chapters are short and to the point. Which encourages you to keep reading. No need to read front to back. You can page around. Few diagrams. Disclosure: I work with Marty from time to time. I started my conversion to modern product management at one of his public seminars in Santa Clara, CA in 2013. During that seminar, I had an epiphany that the way I had been creating products for the first 15 years of my career was wasteful and misguided. In the 15 years before listening to Marty, I’d probably done a dozen customer interviews. Since then, in the past 5 years, I’ve done over 400. Jim Morris. Founder, Product Discovery Group. Co-Founder, Brightday.com. Former Head of Product, PowerReviews.com. I mentor PMs and embed with Product teams to coach Product Discovery. I aim to make every Product team’s life easier and more fulfilling through spending their time and energy more wisely.